Earn up to 41,560 reward points. Handmade works of art from Nashville. Whether you play jazz, rockabilly, country, metal or blues, the Jazz Cat has the style and tone to help you achieve the tone in your head. The semi-hollow korina body has an inset flamed maple cap on the top and back. The aluminum plates are kept to a minimum to showcase the beautiful figure on the wood. Creating the tone of these guitars are TV Jones Pow’rTron Humbuckers in the neck and bridge positions. Combined with the unique 5-way pickups selector and Teye’s proprietary MOJO control, the Jazz Cat can create guitar tones that range from a sparkly single-coil pickup tone or a fat humbucker roar, and everything in-between. The proprietary SuperSustain™ bridge and Duesenburg Tremolo add to the overall resonance of the guitar. The possibilities are endless making this work of art not only beautiful but incredibly functional. 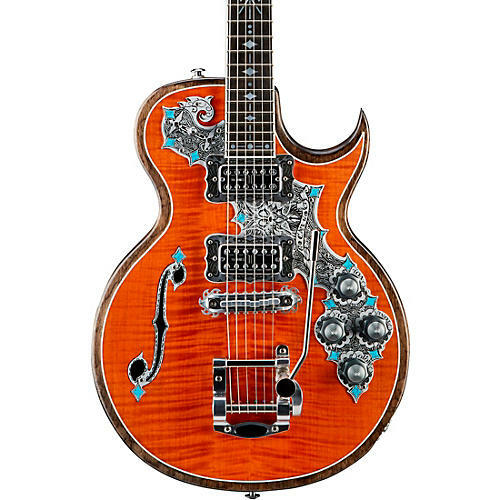 Teye Guitars are handcrafted one at a time by skilled luthiers in their shop in Nashville, Tennessee. Each instrument features a hand-stained and oiled Shipwreck finish and no two are identical.